Beautiful award winning manuscript map of Latvia. 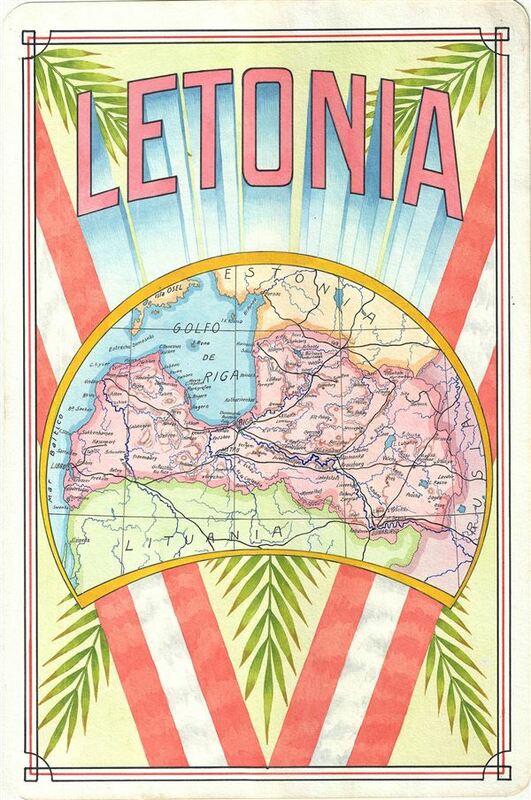 This is a charming 1939 manuscript or hand drawn map of Latvia or Letonia by Antonio Raggio. It covers the Republic of Latvia, one of the three Baltic states in Northern Europe. The map is beautifully detailed and notes rivers, roads, towns, cities, islands, mountains and parts of the surrounding counties of Estonia, Lithuania and Russia. The map proper is surrounded by beautifully illustrated graphics and a leaf motif. This map is part of Antonio F. Raggioâ€™s Coleccion de Europe, a series of ink and watercolor maps on cards prepared for the Exposicion Filatelica Internacional or CYTRAâ€™s 11th Congreso de la Union Postal Universal (World Postal Congress), held in Buenos Aires, Argentina in 1839. The series included maps representing many European countries as well as parts of America, and won the award given by â€˜La Sociedad Filatelica Argentinaâ€™. Although the detail on the map cards is extremely fine, it is likely that the manuscript cards might have been proof drawings or models for the engraving of stamps. Very good. Hand drawn map.